Every Tuesday, the Carsons (Melissa and Mike) and the Nevilles (Courtney and Bob and Oliver, the most curious and hilarious and wonderful kid in the world) and I alternate between cooking and hosting dinner for everyone else. This week it’s my turn … and the return of Johnbalaya, which is jambalaya made by me. I begin with two family-sized boxes of Zatarain’s jambalaya mix. 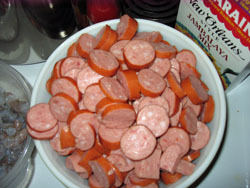 Each box asks for 1.5 pounds of one meat — chicken, shrimp, or smoked sausage. Cooking two boxes, therefore, should require three pounds of one meat. I find it almost adorable that Zatarain’s is naive enough to find this adequate. … that I just finished peeling away from their tails and shells. That’s eight pounds of meat for a recipe that only calls for three. 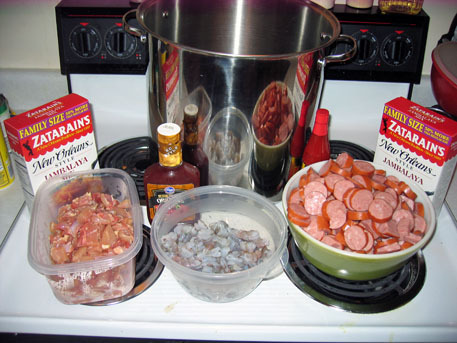 I’ll cook the two boxes of jambalaya mix and the smoked sausage together from the beginning in a giant pot. 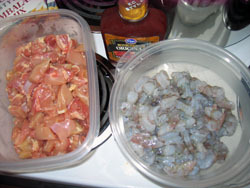 Separately from the giant pot and each other, I’ll sautee the chicken and the shrimp in garlic and butter. This will allow the rice to cook fully; once I’m satisfied with the rice and sausage, I’ll slowly begin mixing in the chicken and shrimp. I’ll add a dollop of BBQ sauce for some extra flavor and offer a bottle of hot sauce on the side for anyone who’d like to give their bowl a little extra kick. Drop by if you’re in the neighborhood. Dinner’s at 6, and we’ll probably have enough. WOW. And tonight I was looking forward to having salmon. Not anymore! Looks awesome! Hmmmm……those ingredients look vaguely familiar. That’s a real cajun treat.